Khas Fashion has garnered great repute and appreciation in the world of fashion and textile due to its forward-looking approach and innovation designs. This clothing line has mastered into several genres of style making, from menswear to womenswear and even the home accessories. 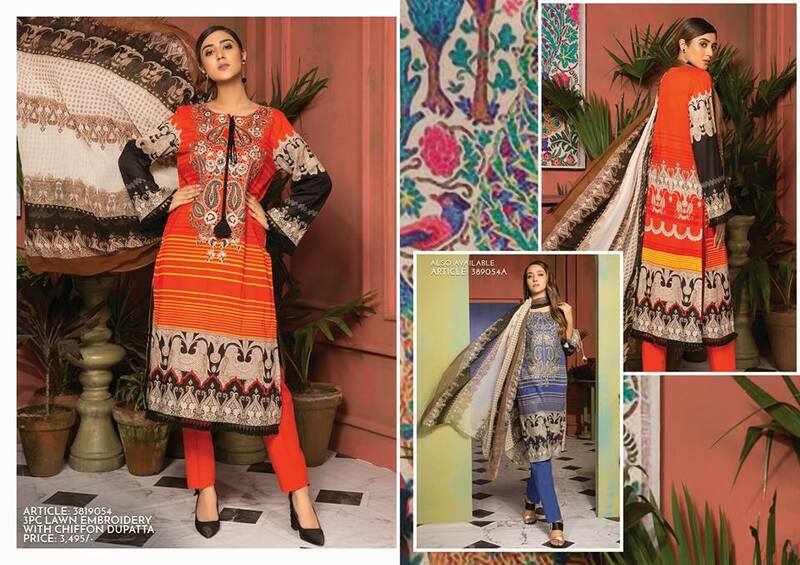 The most anticipated of all is the Khas lawn collection which is always received by their customers with more zeal and excitement every passing year. Here we are discussing the Khas 2 Piece Beautiful Lawn Dresses Collection 2019. This two-piece laws suit will take you into the world of appeasement and pleasure with its bright colors and blooming prints. 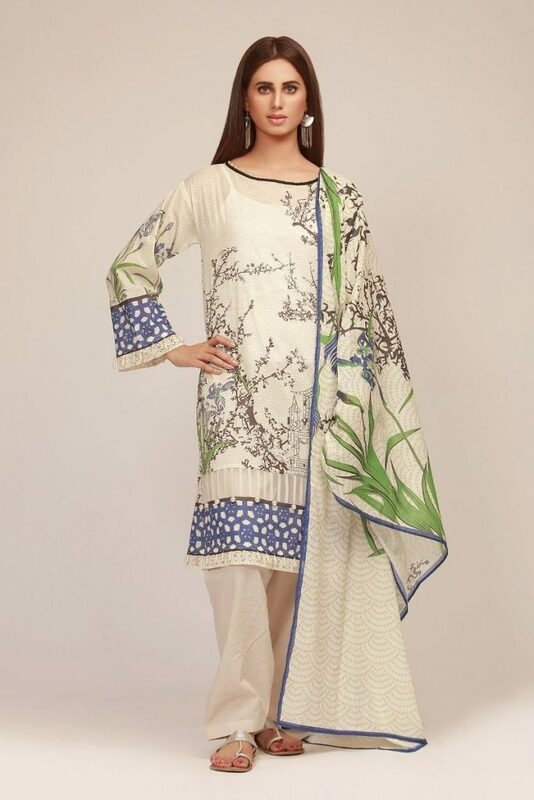 Keeping the dazzling summers in mind, experts at Khas has given a “khas” (special) consideration to the utility of their lawn suits to the best that is why they came up such a mild base of pistachio green paired with pure and white. This base color is highlighted with the use of multi-hued floral patterns around the bottom. Since the prints are concentrated around the borderline, the neckline can be style into real chic off shoulder style. In exemplaris, the designers have tactfully brought together the two extremes of bright and dark with a soothing effect for the eyes. 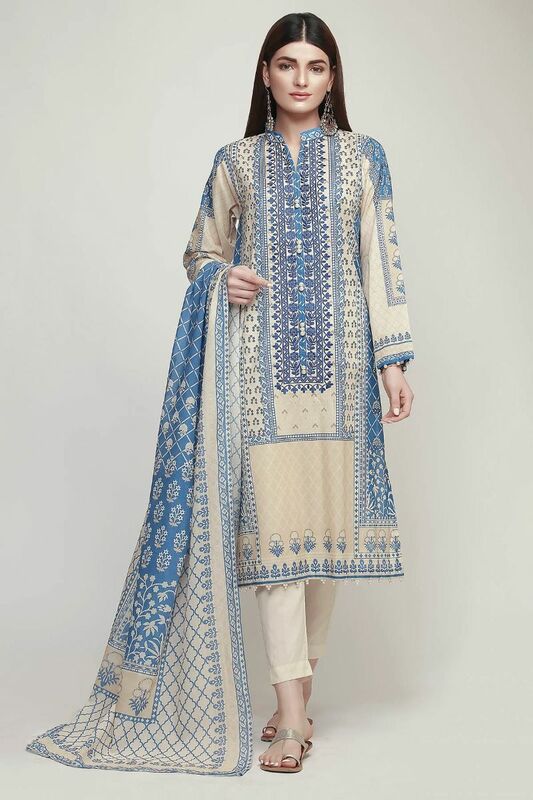 Blues are always a relief to carry around in summers, and that’s what exactly the khas store had in consideration. The shirt piece is loaded with embedded patterns in light blue over the base of a dark blue. The front of the shirt is designed with fresh blooming flowers in pink; this contrasting use of color has given the shirt piece a unique and tempting appeal. And the best way to make the shirt even more prominent is to pair it with plain white trousers. Aerin gives you the privilege of carrying black with ultimate style and comfort. When compared to other pieces of this collection, this suit piece is more neutral in colors and gives you a bold and strong outlook. The shirt is designed with a regal outlook, having archetypal structural prints paired with flowers and intermixed patterns. It has a prominent and contrast borderline which complements the sleeves and the neckline motifs. This borderline also gives the shirt a sharp look when carried with matching black trousers. 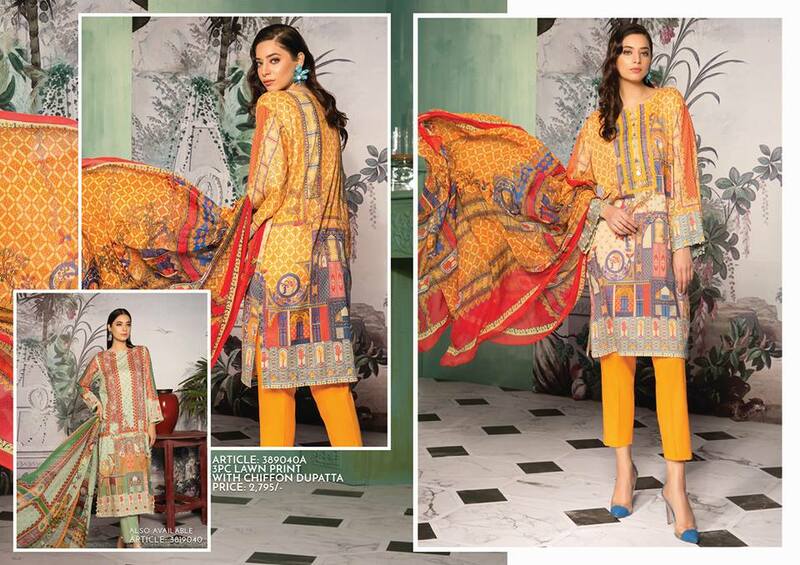 Dupatta is the real charmer in this one, which creates a striking contrast with the shirt and its base color. Khas has made sure to cover the entire color palette in this 2019 summer collection to provide you series of different wardrobe options. Aurora is all about bright and tempting colors. The base is set mild pink which is complemented using prominent floral prints on the front. 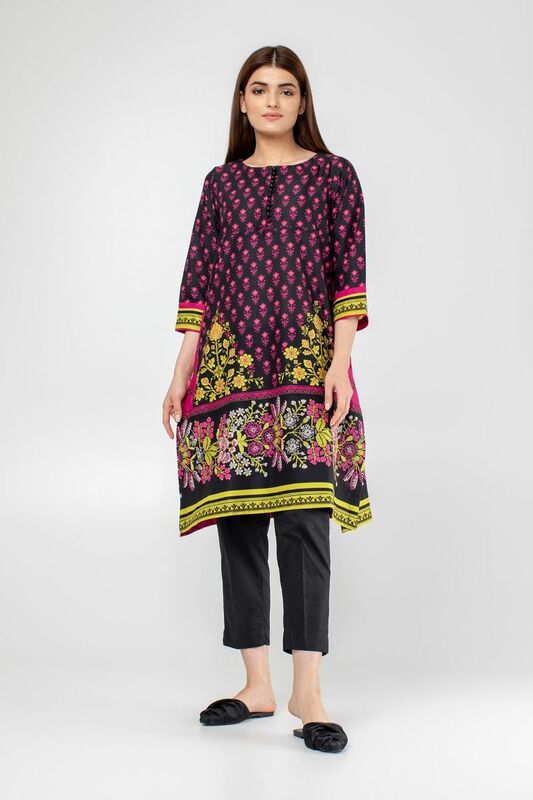 The shirt carries intricate floral prints whereas the dupatta has large blossoms in different hues. Aurora can make an excellent evening dress as it has the most suitable theme. The neckline is bordered with soft colored patterns which makes the borderline even more prominent. It can be best carried with black trousers whereas white also seems like a good choice. You will be fascinated by the color scheme of the aplomb series. 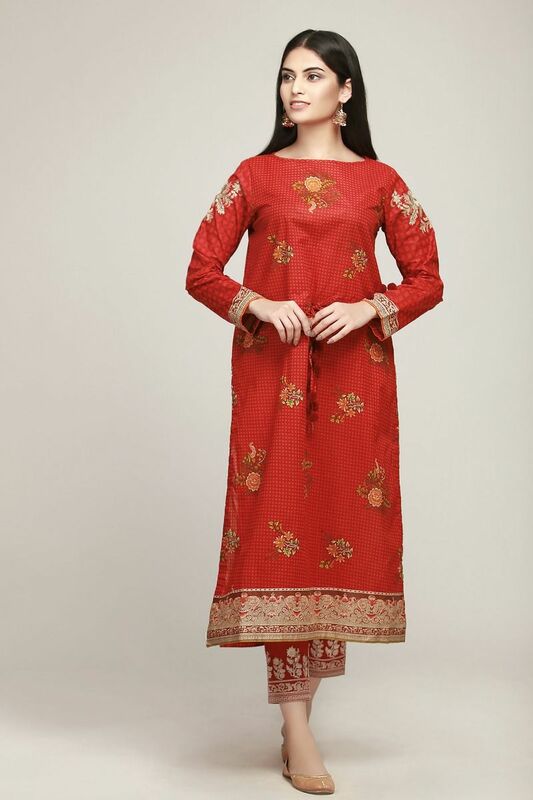 It’s not just the decent red in this dress which catches your eye, but the entire ensemble is irresistibly appealing. There is a perfect mix of symmetry and beauty in this one; the block patterns are paired with nature-inspired prints. Its sleeves create a sharp contrast with the main body of the shirt and follow a softer color scheme. Opposite to all of this, the dupatta is designed in dark shade of red or maroonish red. It is printed with the same shadowy prints has the base of the shirt has. Feel the refreshing summer breeze this year with this opulent piece of apparel. Bonheur is designed with such soft shades that it gives you a refreshing outlook every time. 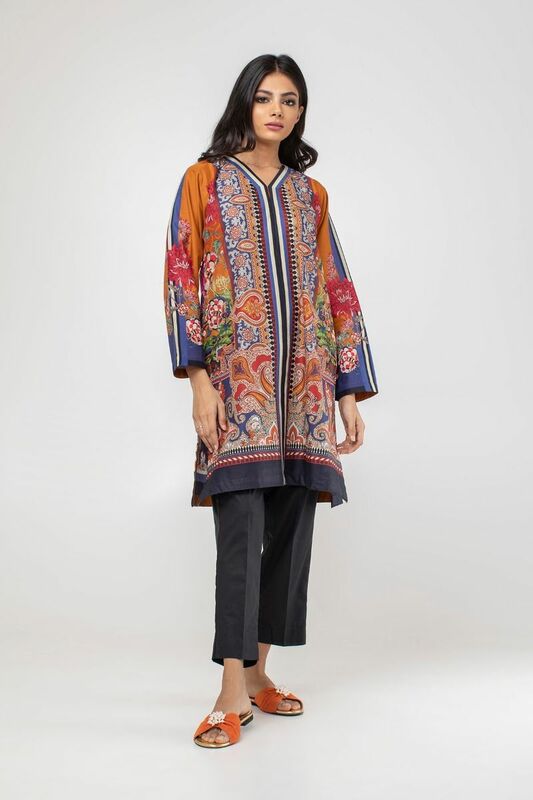 Where the shirt is rather plain and simple with series of prints around the borderline, the dupatta carries a full blow of prints. Together these two pieces create a nice blend. Essentially the neckline is plain, which gives you many options to play with its design. 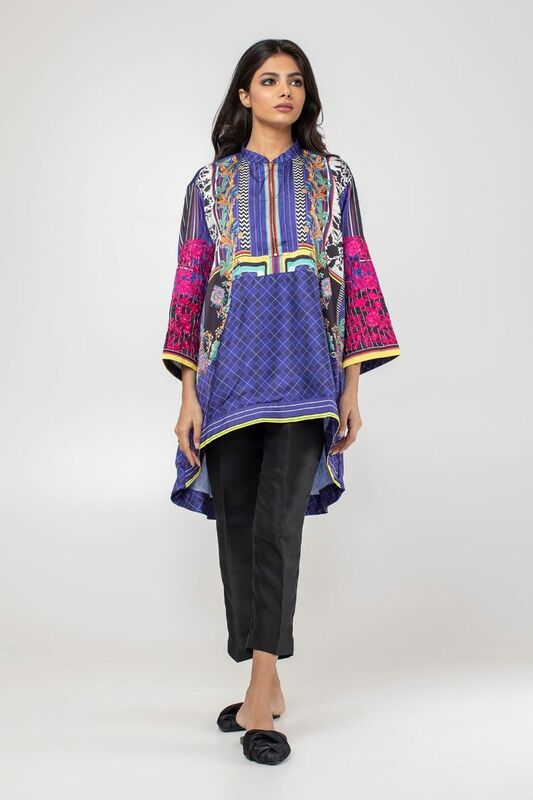 Dupatta is hued to complement the prints around the shirt. When carried with plain white bottoms, this suit can be to opt for bright hot days. Grey ombre sleeves and the thread work in pink, make this dress a bliss for the sight. 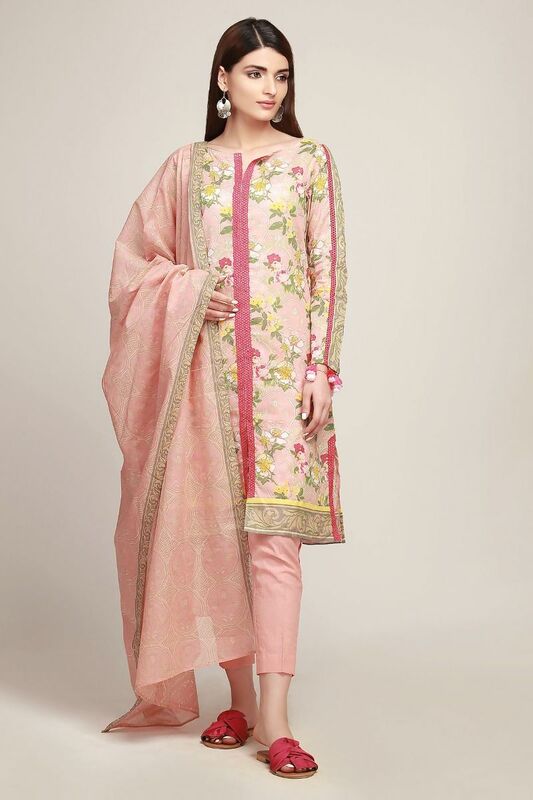 The front is crafted with rosy patterns and mild embroideries in pink and green. The back has an entirely different scheme with prominent orange flowers and patterns printed across its entire pane. There is a mix of architectural designs and the natural landscape. Both these themes are also combined in the dupatta which has an appealing pink base. The ends of the dupatta are summery printed with darker shades to give it more depth. Summer has just begun its journey, a lot of women seem to be wondering about the latest summer styles and clothing designs. Well! With the latest Maria.B summer collection 2019, all your worries will be gone. Here you can find yourself the range of dresses available in a pure lawn, mixed lawn, and cotton. One of the most prominent features of all the Maria.B collections is it has that formal and glitzy touch which you can carry anywhere special. It creates a balance with the delicate and elegant embellishments packaged with amalgamations of soft and dull hues. 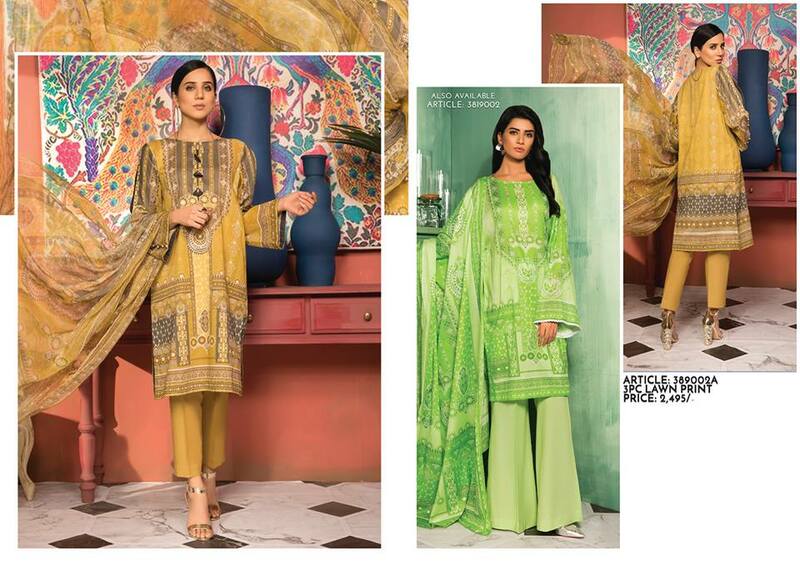 This Maria b lawn dresses collection also seems to be having the epic collection of lawn chiffon and net dresses. 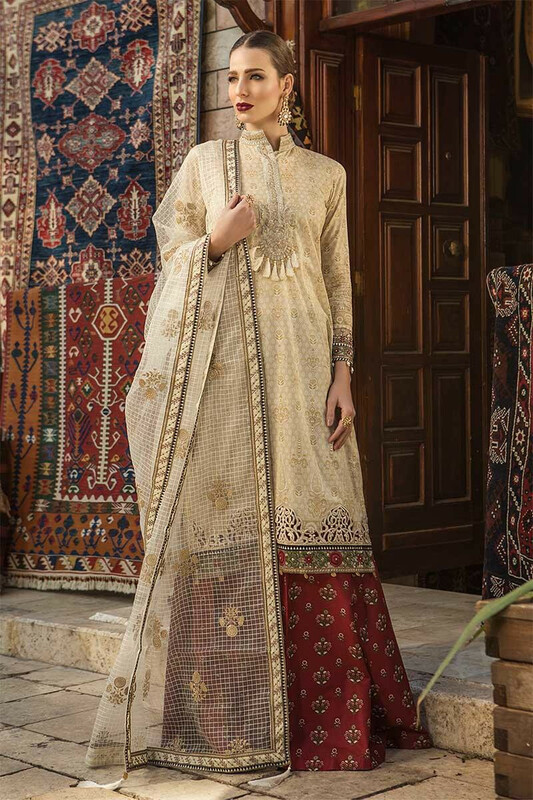 The apparels are specifically designed for all sorts of formal occasions; these define the embroidery work in the thread, tilla, and decent applique work. Embroidery is also done on tissue patches that give a superb look. Such dresses carry more distinct and bold hues with amazing sets of contrast. Embellishment around the neckline and use of motifs over the shirts look fascinating. Medium length shirts with trousers and printed dupattas create a novelty in these attires. Particularly for summers, the fabrics need to be comfy to wear and soft to feel, Maria.B has also met such needs by the quality of the fabrics used. 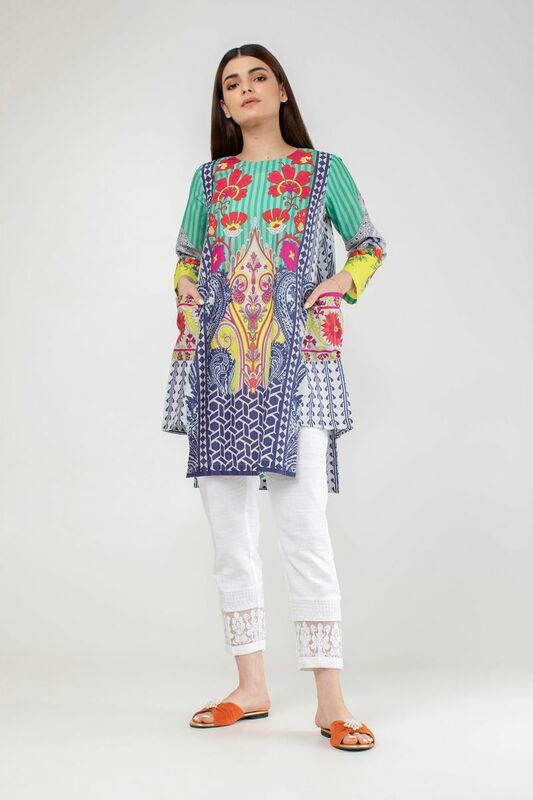 The summer lawn collection carries printed dresses and shirts which serve both for formal and casual occasions. Few carry refreshing floral prints with twigs and swirls used around the motifs. The prints are highlighted through the use of light thread work embroidery. Digital prints and block prints also represent the sheer beauty and aesthetic appeal. Use of fresh colours makes this collection more appealing for summers, like crimson orange, lime yellow, pastel pink, move, white, peach, beige, salmon pink and crystal blue. They are used to set a delightful contrast in each of its apparels. You won’t be missing out anything if you opt for either of these dresses. Such great quality inconveniently reasonable prices are hard to believe, but Maria.B has made it possible. Despite its great fame of name in the fashion circles of Pakistan, Maria.B has brought down the prices to the level of its customers. A particular class with the taste in Fashion always has Maria.B in their latest list of wardrobes. So if you want to grab something new and unique for this summer, then your wait is over! Visit the online Maria.B boutique or the nearest outlet to check and try their creatively designed outfits. This pastel pink suit from this assortment is just amazing. 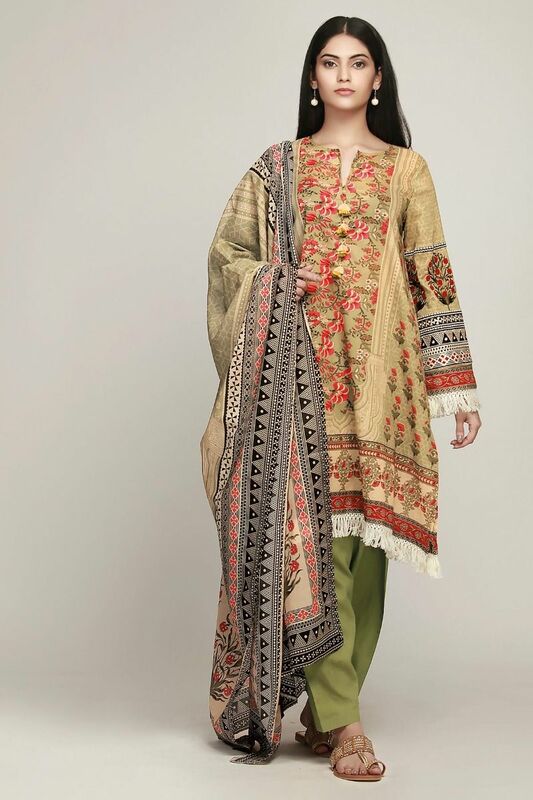 The chicken Kari embroidery on the shirt paired with an embroidered net dupatta. It comes up with white cambric trouser. Bold colors are also introduced in these collections for the people who love bright shades. The bottom lace patches are added and embroidered lace necklines. They are paired with printed silk and lawn dupattas. Maria b always shows simplicity and elegance in her designs. As it is clearly seen in this assortment. Light teal blue, peachy pink, lavender, violet, light blue, off-white are the light shades that are present. 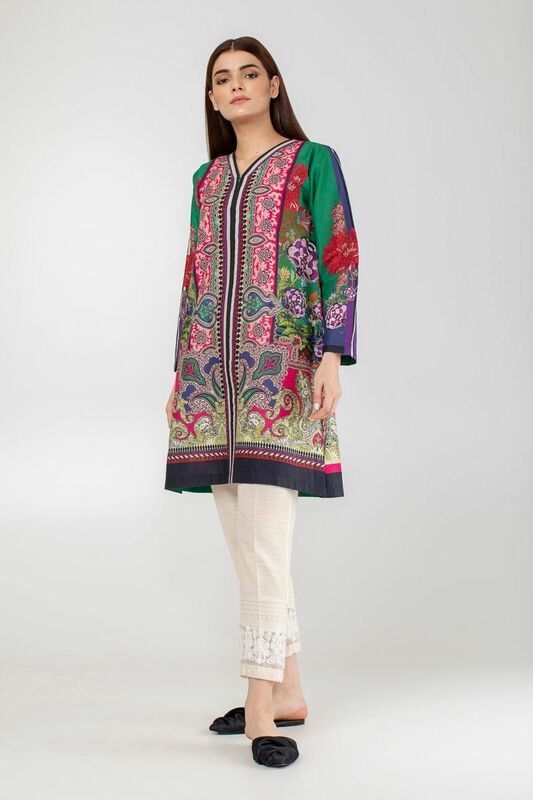 Jacquard shirts, Chicken Kari embroidered shirts are the amazing part of this series. The beautiful young Actress and model Noor Khan is the new face of this Maria B summer lawn collection 2019. I hope you will fall in love with their designs. This summer, no scorching heat will harm the glare of your outlook. 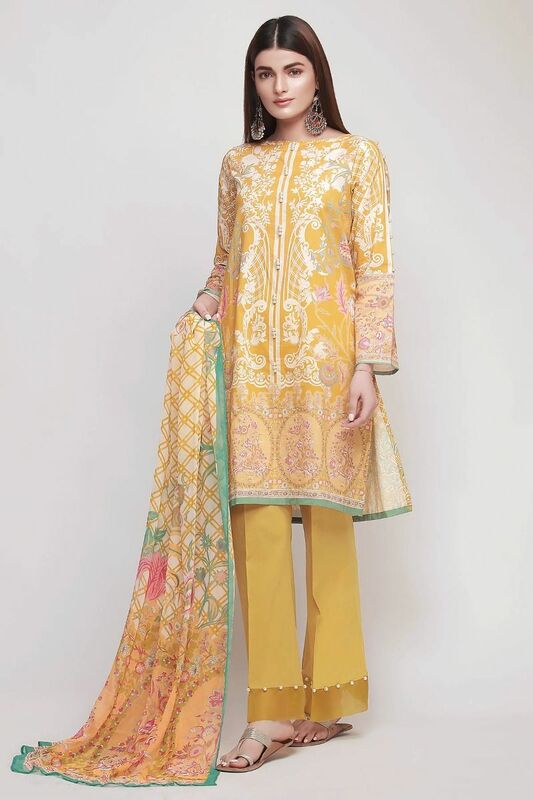 You can still look ravishing and refreshing as ever with the delightful, charming and lovely hues by Gul Ahmed. 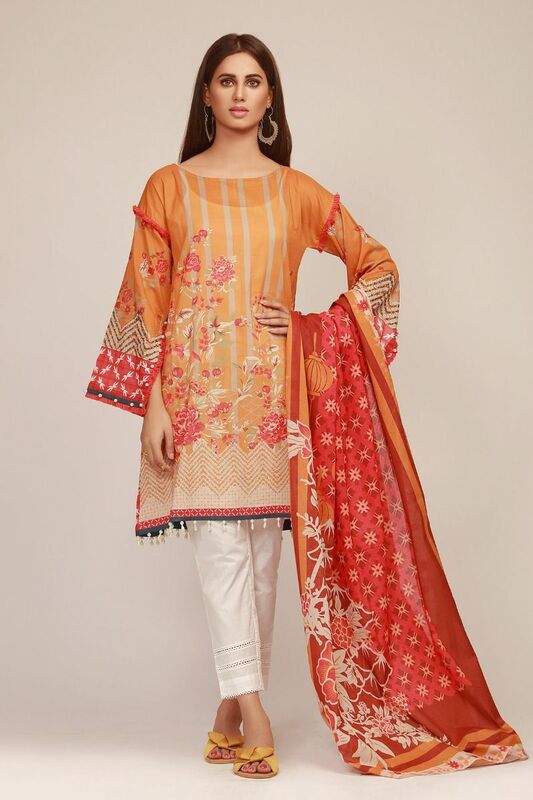 Gul Ahmed is one of the most reliable and famous clothing in Pakistan that promises to provide you not only great quality fabrics but also amazing deals of apparels with funky designs. For years, Gul Ahmed has been proudly launching its various collection of best quality lawn, linens, cotton, chiffon, silk and khadi fabric. Stitched and Unstitched Fabrics, both speak of their best quality through their latest of the designs. Today we will discuss the latest summer embroidered lawn dresses trends. 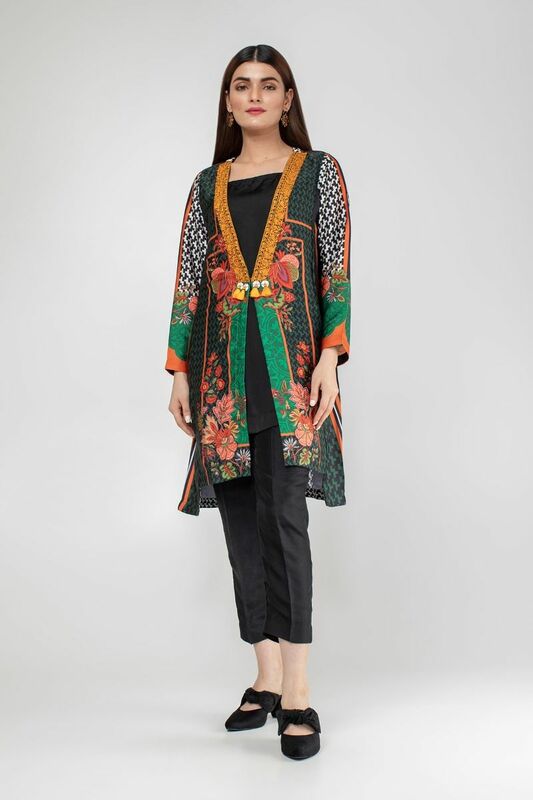 “Best Original Lawn” is one of the slogans of this clothing brand and Gul Ahmed proved the fact. This year get ready for the ultimate summer treat. Yes, ladies! 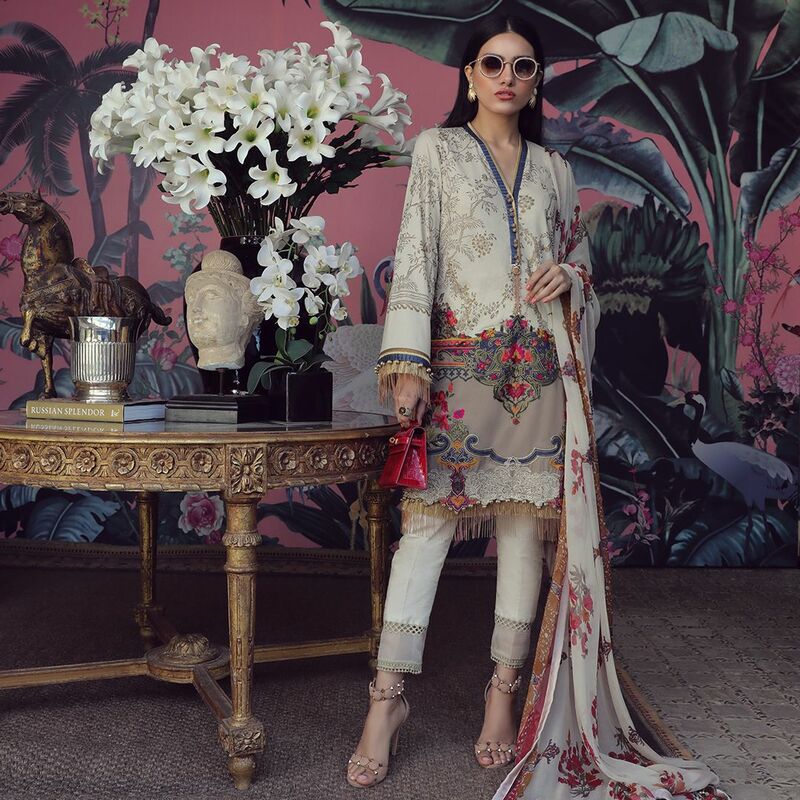 The latest Gul Ahmed Summer Embroidered Lawn Dresses Collection 2019 has been released. And soon its apparels will become the part of every other wardrobe. Contrasting hues of fabrics with amazing prints and motifs are all there to stun your sight. These ravishing designs are available in all the soft and bold colors including red, crimson, black, blue, green, grey, white and various other tempting shades. Alluring prints and motifs will make these dresses complement your cool summer outlook. Volume 01 and Volume 02 of the summer catalog is launched on the 27th of this month. Available from all the outlets and online stores. 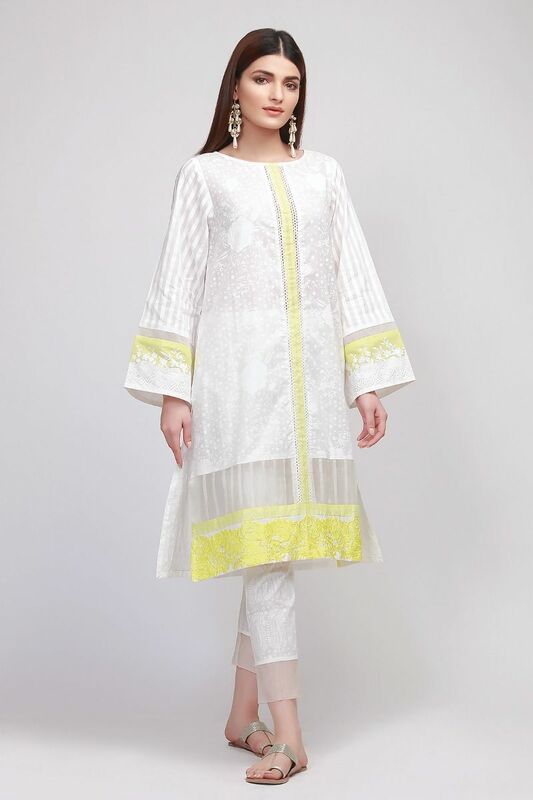 The range of white dresses is absolutely stunning with multi-hued chiffon dupattas. This range is available in both the plain white and self-printed white. The catalog carries each apparel stitched into wonderful designs. You can design them into capes or in shirts with pencil trousers. Other than white, another range of color is red contrasted with peach, orange, yellow and rust. Red with the beige colored motifs printed on the back and front of the shirt looks perfect. While printed chiffon dupattas with plain lawn are the charm of this range. The lawn various from 100% pure to the lawn mixed with cotton which is more appropriate for the early summers whereas the pure lawn is more suitable for the midsummers. Bold and funky chic designs are also available in this range. It has bold prints in black, blue and greens will steal your sight. Beauty with elegance has become the ritual to follow by Gul Ahmed. Their latest series of dresses also reminds you of the same. Silk always feel luxurious and comfy. 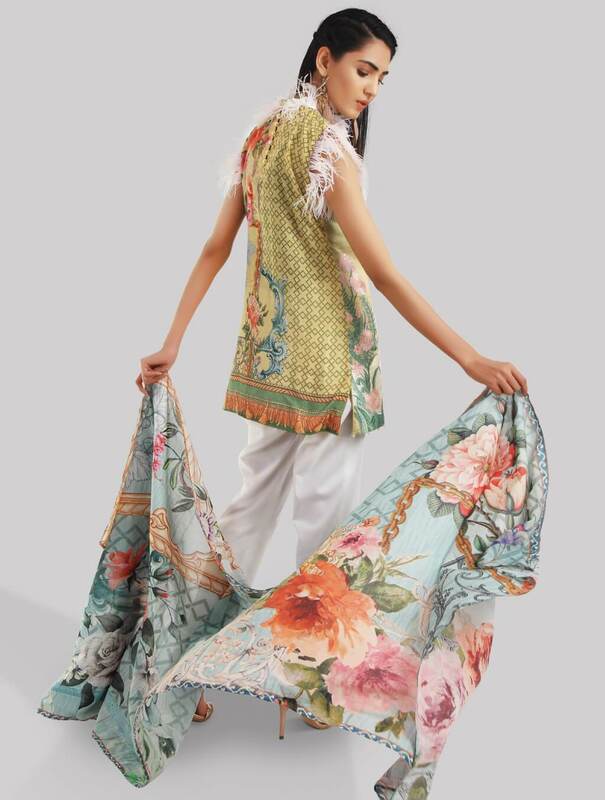 Gul Ahmed has launched a special collection of silk lawn dresses containing digital printed and embroidered silk suits. Jacquard fabric is always loved by the ladies. It looks so delicate and perfect for summers. Check out this exciting series of jacquard suits. This assortment contains tissue silk dupattas along with embroidered jacquards shirts. Some designs also contain polyester laces. This series contains fancy embroidered swiss voile shirts with delicate embroideries and adornments. Mostly light pastel or bold colors are seen there. Summer season is just coming, every designer is busy in providing and managing their latest arrivals of this season. 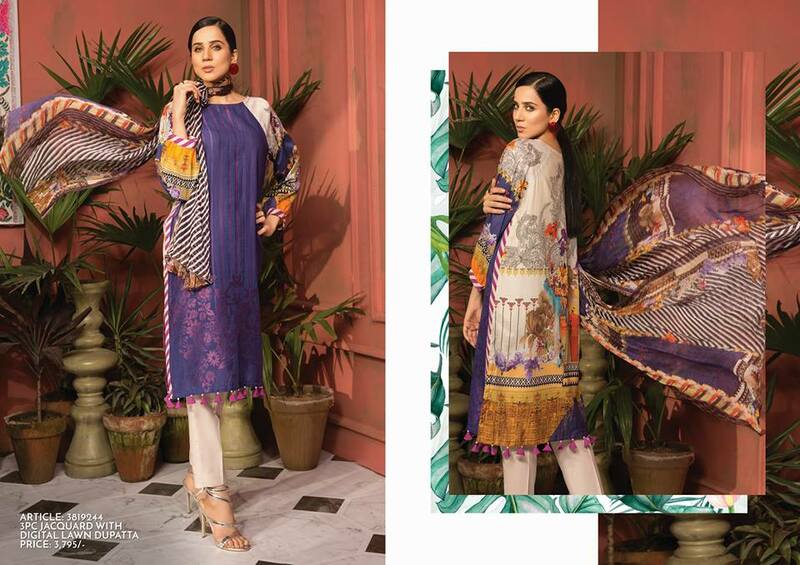 Gul Ahmed is not so far, they have just newly introduced their Collection titled as Gul Ahmed Summer Lawn Dresses Collection 2019 which is the mixture of summer dresses which are just according to modern fashion trends and bold styles. Gul Ahmed is one of the well-known textiles of Pakistan fashion and fabric industry. It generally offers higher quality lawn fabric intended with the latest prints and designs. 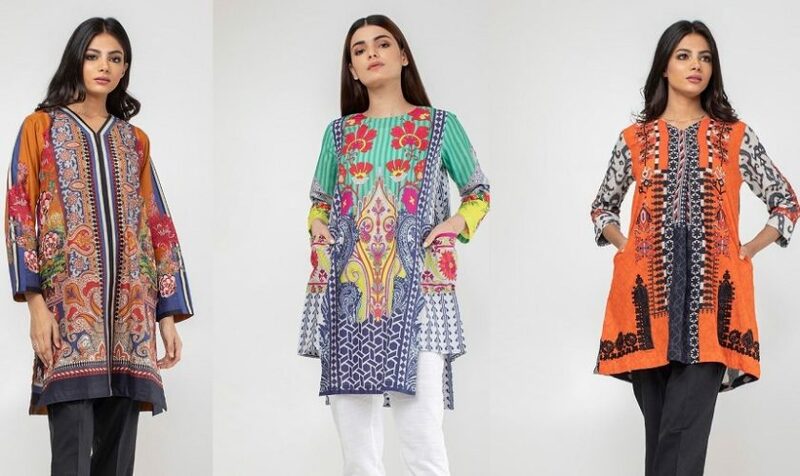 Gul Ahmed Printed Lawn Dresses Collection 2019 consists of the unstitched fabric of digitally printed lawn and chunri designs. All these dresses are comfortable and easy to wear throughout this summers. Gul Ahmad lawn Engravings are very appealing and intriguing that will be satisfying the lawn in this summer. This printed summer lawn dresses collection is well designed magnificently and the model in their strategy is Famous Models. This season the trend of short frocks, peplums and medium shirts are popular. You’ll really like just after viewing the photo gallery posted just below. This series is loaded with a lot of lovely shades and coloration patterns and they will surely capture your heart. This assortment is now available at their all leading stores. Be the first to grab the favourite piece and update your summer wardrobe with these mind-blowing recently styled outfits. Check the photo gallery posted below and get inspire yourself with latest designs. Chunri has always been loved and adored by the young ladies. 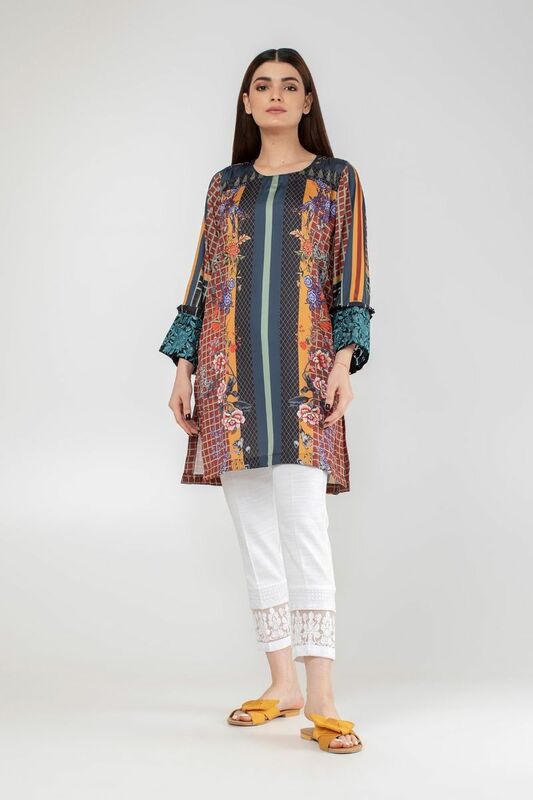 Chunri prints have always been the favorite design for the summer season. Chunri depicts the true culture and trend of Asian fashion. 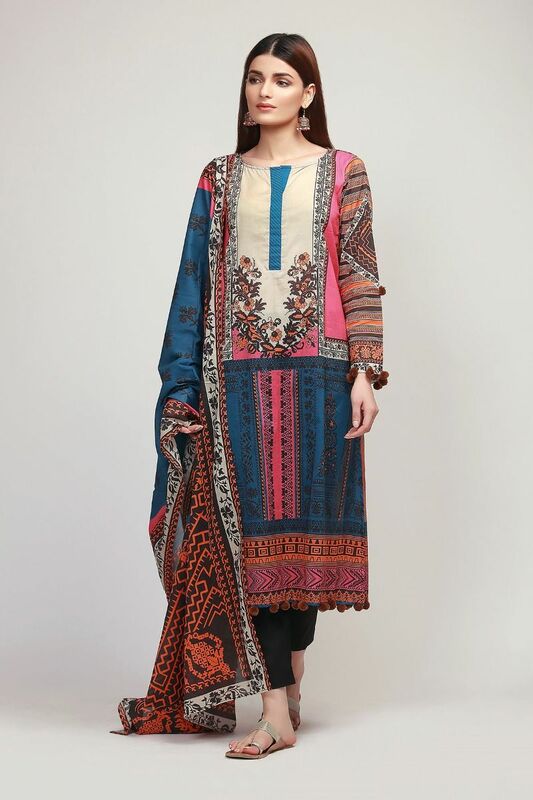 This year Gul Ahmad has presented a wide and beautiful range of Chunri printed summer lawn dresses. The elegant prints and styles are really head turning. You can wear them casually and at semi-formal eves. Here we have gathered some of the Chunri summer lawn dresses for you. Let’s have a look! 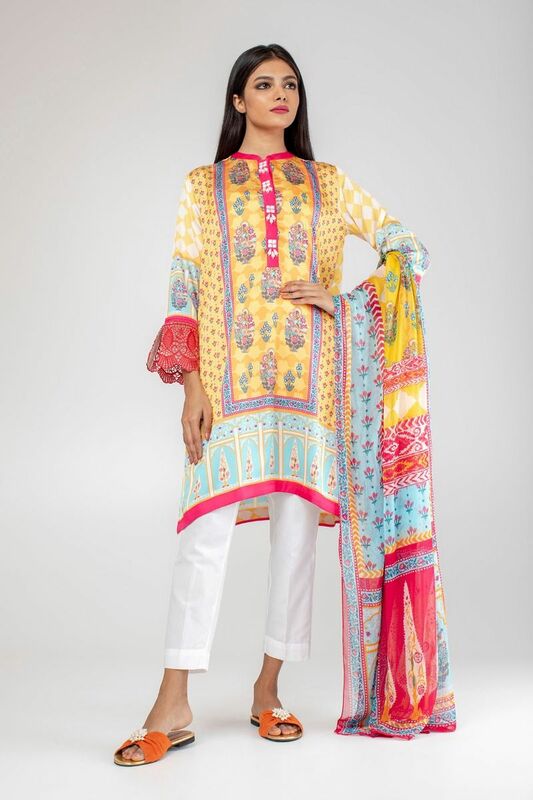 This year Gul Ahmad has presented a wide and beautiful range of Digital printed summer lawn dresses. The elegant prints and styles are really head turning. You can wear them casually and at semi-formal eves. Here we have gathered some of the digital summer lawn dresses for you. Let’s have a look! Dusty pink dresses with decent lawn prints add the charm to this collection. This year the collection has variants of matching hues for both the tops and the bottoms of the same dress. Either there is no contrast, or the contrast are not kept more prominent, but the overall theme is kept quite vibrant. 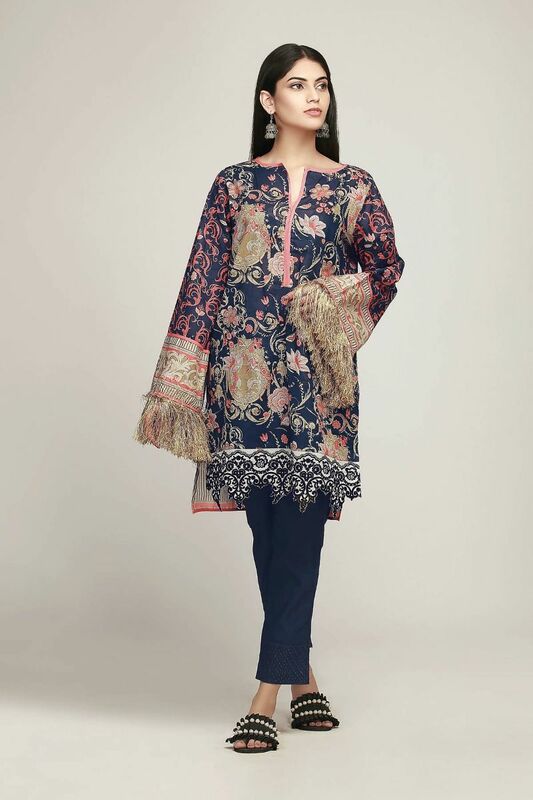 The latest summer collection by Gul Ahmed 2019 is the fusion of distinctive and unique prints in floral designs, or block prints will take you by surprise. Each and every piece of these apparels is worth trying and to carry it this summer to make it more than just ordinary. Well, good news for the fashion lover and trendy girls, Sana Safinaz has just launched its spring summer collection. As we know it’s the time of the year when we have to say goodbye to winter & hello to spring breeze. 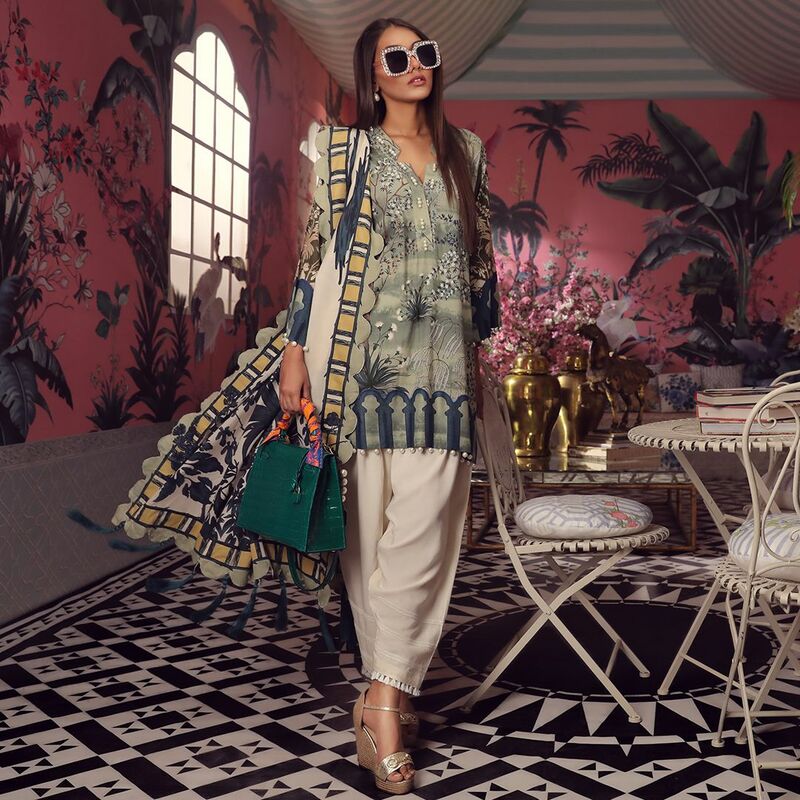 No doubt, the unstitched lawn collection by the brand remains the most awaited ones of the season, but right now it’s time for “Sana Safinaz Muzlin Collection”. Most of the times, ladies prefer unstitched dresses as it helps to have a choice. They can get them stitched according to their preference and needs. 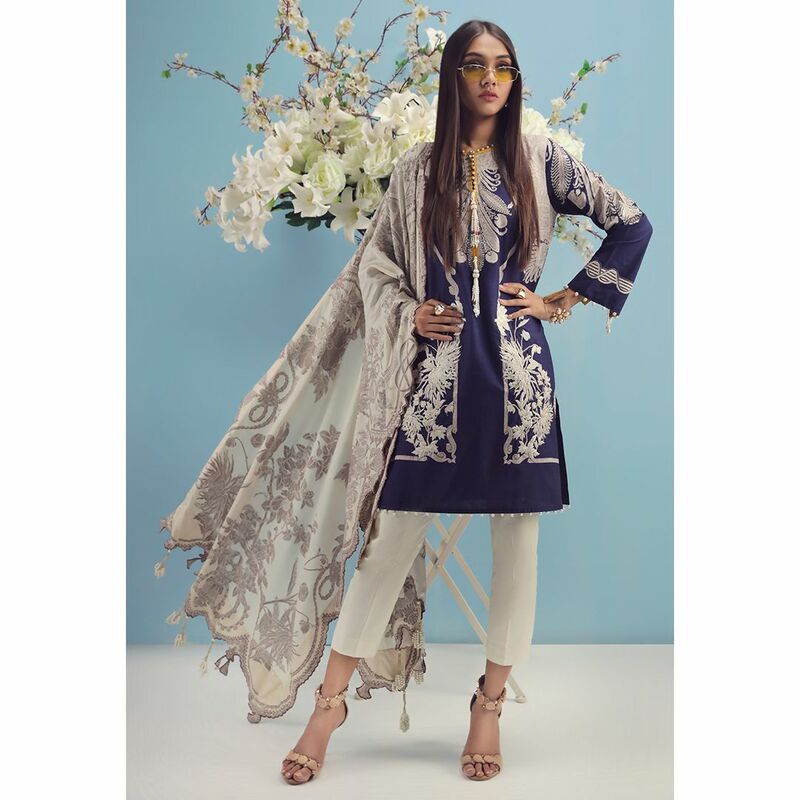 Like always, Sana Safinaz has once again brought a luxurious lifestyle through this collection. This season, the brand has refreshing lawn dresses with rich, gorgeous and appealing designs and prints. I know it’s thrilling news for all the young girls and ladies over there waiting impatiently for the next launch. This line includes a new line of Sana Safinaz Muzlin Collection 2019. That includes unstitched Lawn Suits that includes two pieces, three piece lawn suits, single shirts, and Kurtis. Sana Safinaz is a very well-known and coveted trademark of Pakistan that always brings extraordinary and unique for its customers that are the reason its demand in the market is growing rapidly. It has modest outfits with attractive clothing style. The main design focus is on the fusion of western and eastern variations because it is bold, gallant and contemporary. The queens of haute couture in Pakistan, Sana Hashwani & Safinaz Munir draw creations from their inspirations on a very creative level. In history, the brand has always provided ladies with brilliant collections for every seasons and festival. This time the dresses in “Sana Safinaz Muzlin Collection” has breathtaking color contrasts. The dresses are available in all the leading stores and online since Feb. So, the interval is over girls, grab your choice dress from the market before the stock gets over. The dresses are modish and stunning, sort of casual, formal and purposeful. It has thrown totally new and unique patterns of a new scheme. The brand has always maintained the superior quality fabrics and this time even better fabrics are used than ever. The use of pure chiffon and silk is made for handsome designing on motifs. Where the dupattas are appealing with their elegant prints. The Egyptian prints are so inspiring and attractive to wear. The combos of shirts and dupattas are real loveliness of Sana Safinaz outfits. I know everyone is going to love these eye-catching designs so what about having a look at it right now? And here you go. Have a look on the image gallery posted below and get inspired by the latest designs. The S/S Muzlin Lawn Collection has been released. Go hurry to your nearest outlet and grab your favorite article for this season! Vibrant and exciting colors are the new style for the season. The coolest fashion vibe is all in the year. 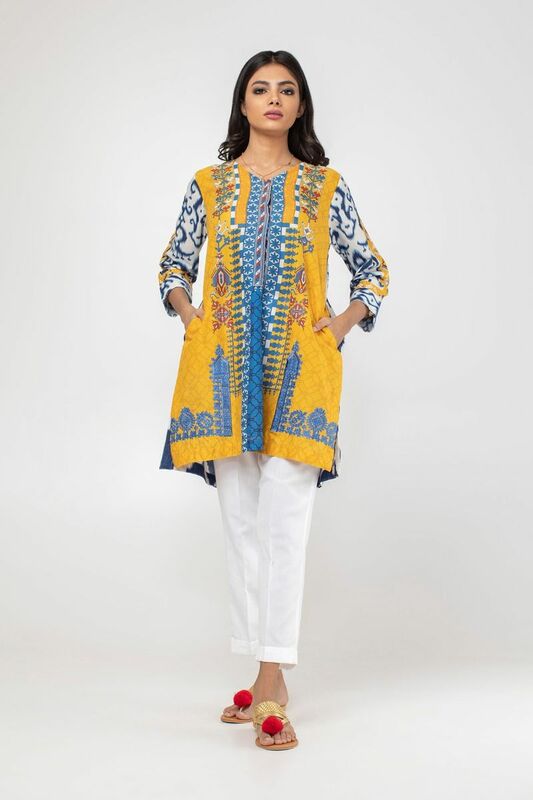 This summer gets you a load of funky designs and bold impressions with the latest summer collection by Khaadi. 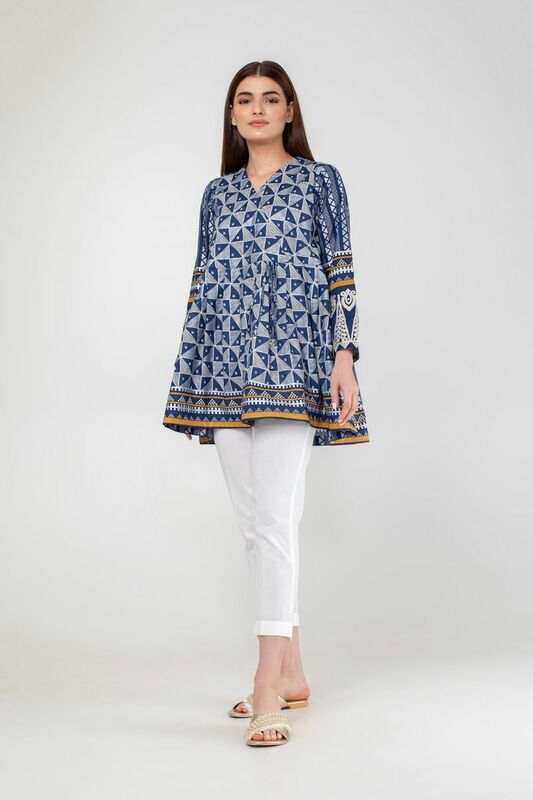 One of the most famous clothing lines of Pakistan, Khaadi is the house of surprise for its nationwide customers, as it always has something new, unique and highly creative. Bold colors with bold impressions come in the package when you opt for khaadi’s finest assortment. Where else to go when you can find yourself the best of the quality and best of the variety under one single label. Today we will discuss the latest summer lawn dresses designs by Khaadi. You might be wondering How exclusive this collection could be? Well, get a hold on to your imaginations as we are going to get you to immerse yourself in the great detail and review about the khaadi latest summer collection. This assortment is going to excite you with its distinctive appeal and magnificent color amalgamations. Each year, khadi proves that how its experts are good at thinking out of the box and bringing something new and fascinating to its customers. Whether you are in your teens or your 20s or 30s, you can opt for this collection for a shiny summer day out. Here we present you the latest summer collection by Khaadi. 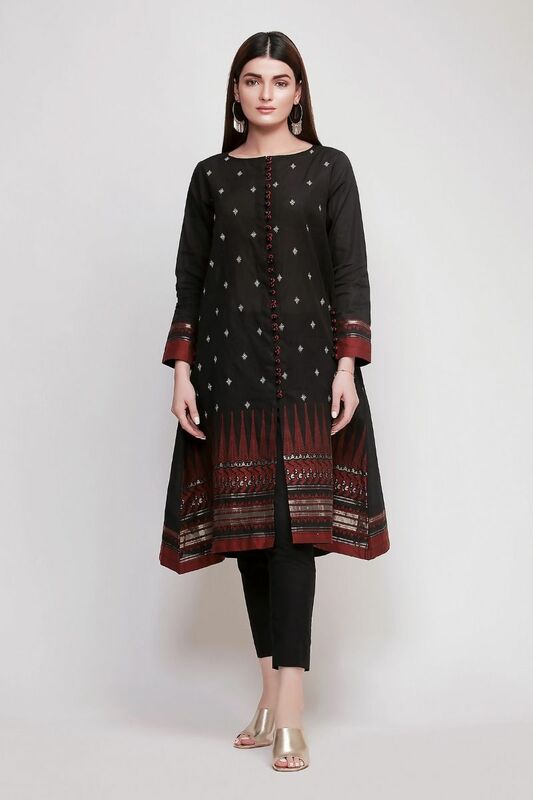 Which comprises of not only kurtas but also of long shirts and designed dresses. 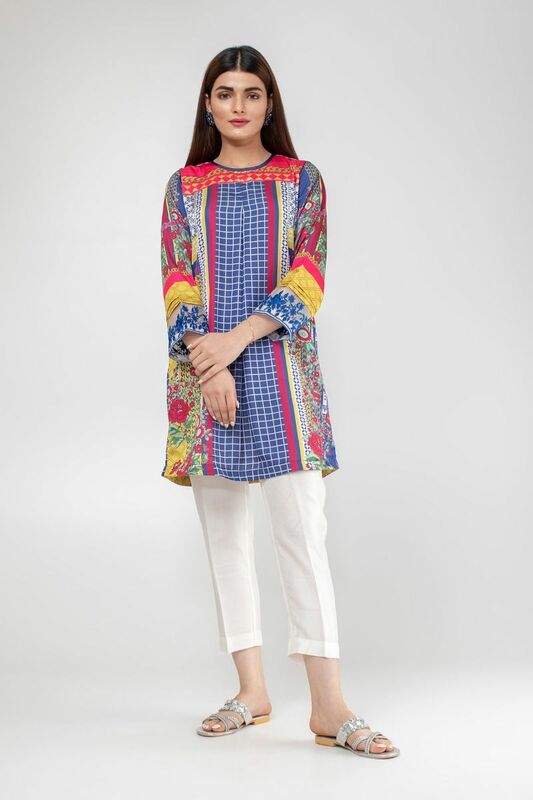 Khaadi lawn is famous for its cool, soft and light prints in eye-catching hues. Whether it’s pure 100% lawn or mixed lawn or even cotton, all type of summer apparels are going to be the charm of this season’s collection. Carrying prints and impressions for stripes, block prints, zig-zags, twisted curls, and criss-cross patterns, the fabric seems great to make yourself a trendy summer outfit. 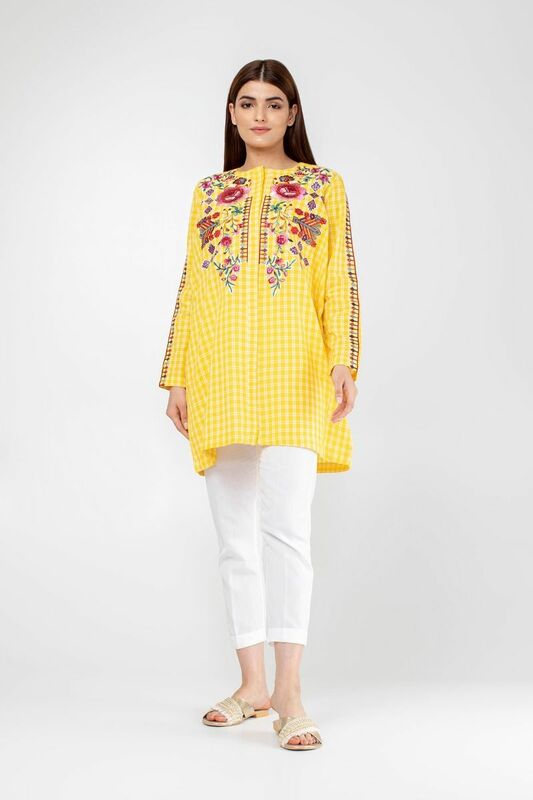 To add a little formal touch to the apparels, Khaadi has brought a hint of floral motifs embroidered with the thread work over the shirts and kurtas. Colors like pastel blue, navy blue, cream, beige, shades of green and white are seen blooming in this collection. It gives you great options and choices to carry on the occasion and your personal interest. Khadi also provides you with the dresses in different series of dupattas either with chiffon dupattas or in the lawn or cotton. These dupattas are available in a variety of prints and shades contrasting with the dress. Perhaps the entire assortment is one big bowl of trend and style which guarantee higher the quality with best affordable prices. 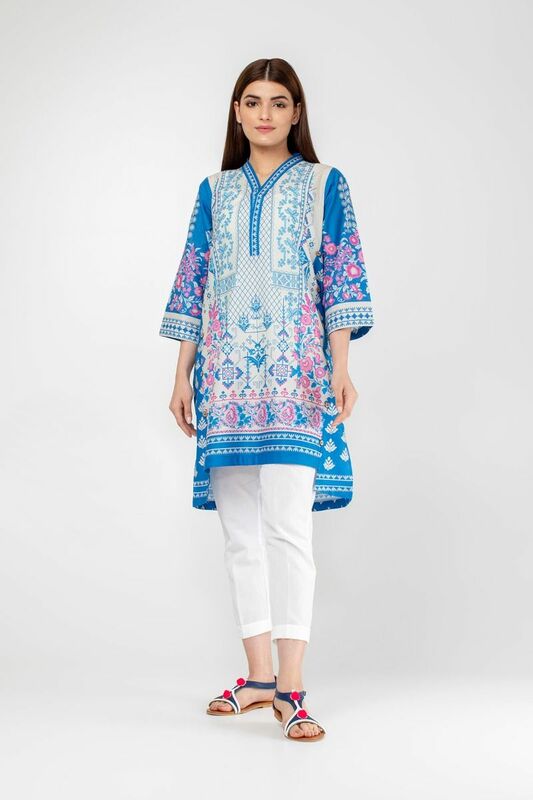 Khaadi is always famous for its amazing lawn prints and subtle embroideries. The floral patterns, abstract arts, geometric designs, etc are just astounding. 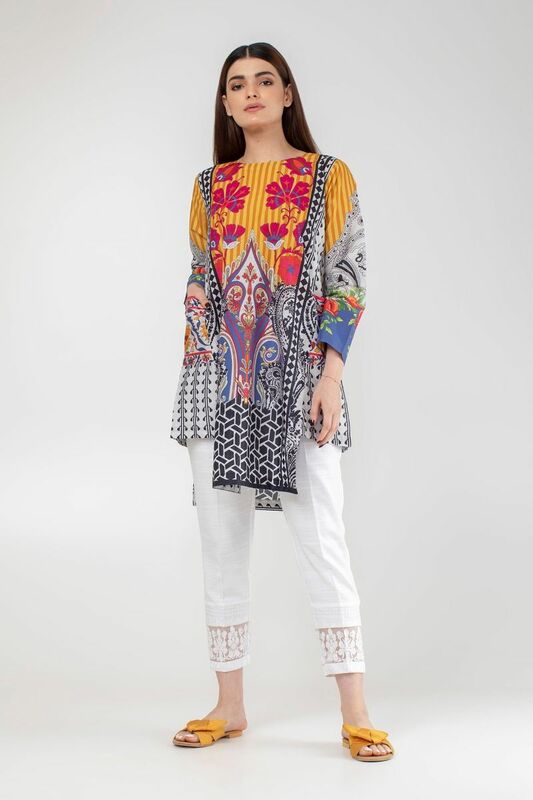 The printed collection contains one piece single shirts, two-piece shirt/ dupatta, shirt/ trousers. Pastel colors are more seen this year. As they are perfect for summer season. Most people prefer light shades so pastel is a good choice. For color-loving people dark shades are also introduced. These motifs are embroidered with the borders, around the sleeves and the neckline of the shirts. Use of vibrant contrast in the thread work makes the entire outlook of the dress much more alluring. Something you probably wouldn’t want to get your eyes off. It is something you can carry on formal events or even on casual hangouts. However, the quality of the entire collection is completely up to the mark. Just have an eye on the below-posted image gallery. I must say you will fall in love with each and every design. In the embroidered collection you can see the beautiful embroidery work sleeves, necklines, hem, and trousers. The red suit with black embroidery patches on the shirt and printed border is the best one to wear as a formal outfit. Khaadi produces all type of designs. Heavy embroidered as well as simple ones. You can wear these dresses for normal casual routines as well as formal days. You can see every color combinations. Each piece is a masterpiece of art. 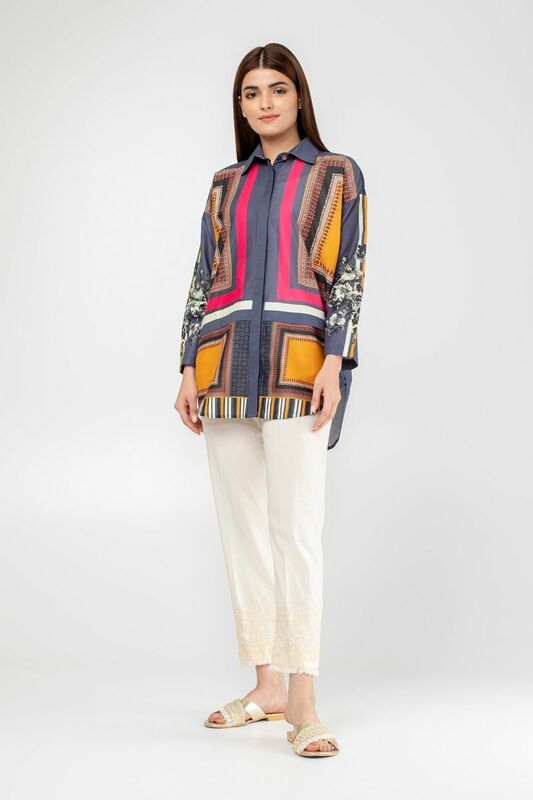 You can see the beautiful and shiny jacquard shirts in bold patterns and colors. We are falling in love with each design. So girls the wait is now over, your favorite Khaadi summer collection has recently launched. One of the illustrious fashion labels of Pakistan, Khaadi has presented its fresh and new collection consisting of amazing hues and color combinations. Khaadi is a well-known fashion brand of Pakistan introduced in 1998 and is getting popularity day by day. It always provides fashion lovers with their seasonal needs of clothing that is the reason it is getting air not only in Pakistan but also in foreign countries. The talented designers working under this label have an amazing ability to bring something unique and creative that is appreciated a lot by customers, and that is why its demand is increasing rapidly by the time. All the designer work for Khaadi collections is done by the technologically equipped studio, and different sort of art is depicted. Today we will discuss the most amazing Khaadi ready to wear stylish summer kurtas & dresses collection. Like every year, once again the brand has given a stunning comeback of summer collection via these amazing dresses. 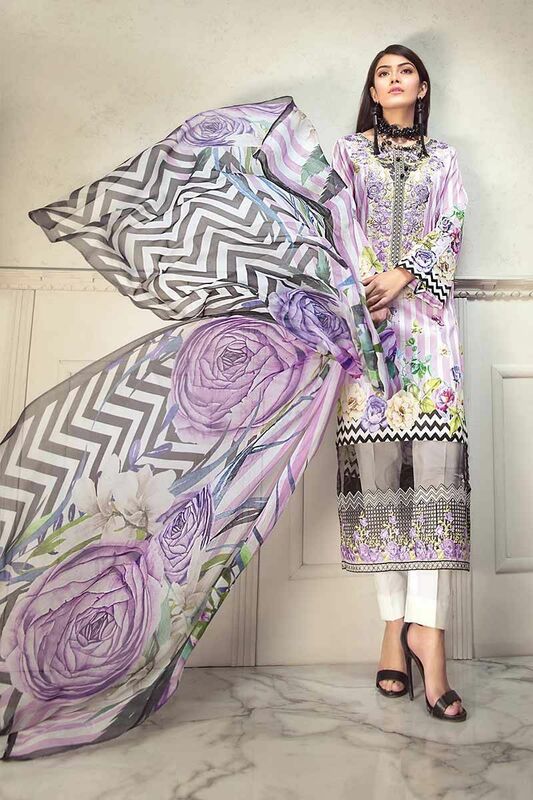 A scenario of totally different lawn prints is given in this collection. The flawless and blooming prints of the stylish summer kurtas and dresses with the attractive color scheme will win everyone’s heart. All of these dresses are elegant, stylish and according to latest fashion. Soft colors and mesmerizing prints will take you to the soulfulness of summer season. The designers have beautifully added the touch of sophistication and refinery along with exhilarating patterns by the alluring embroidery embossed on the neckline. These ready to wear dresses are perfect for casual wear and formal wear. The shirts are available in both short as in knee length as well as long length providing you the free choice of the best suitable one for you. Also, shirts with full sleeves, half sleeves and sleeveless are available to radiant and lambent one’s personality & character giving a feeling of resplendent. Shirt with dupatta and separate pants are seen in the assortment. Like kurta pajama, kurta dupatta, single kurta and full suit. 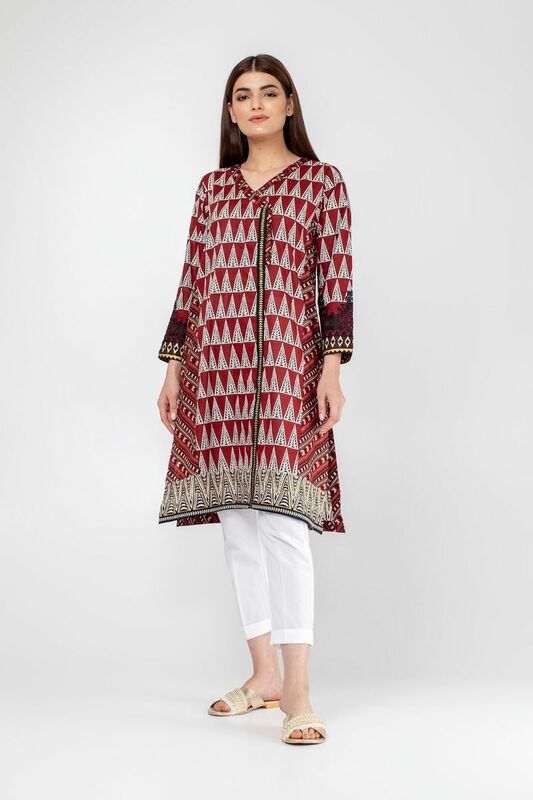 We have seen beautiful embroidery patterns, digital and block prints in this kurta pret collection. The floral prints are adding freshness to kurtas that make it perfect wear for summer. This collection is available in all Khaadi outlets and goof stores in Pakistan. Also, these dresses are available online for the foreigner Khaadi lovers and for the customers who do not have Khaadi outlets in their cities. I am sure that after wearing these kurtas, you cannot pass through a crowd without getting everyone’s attention towards your dress. 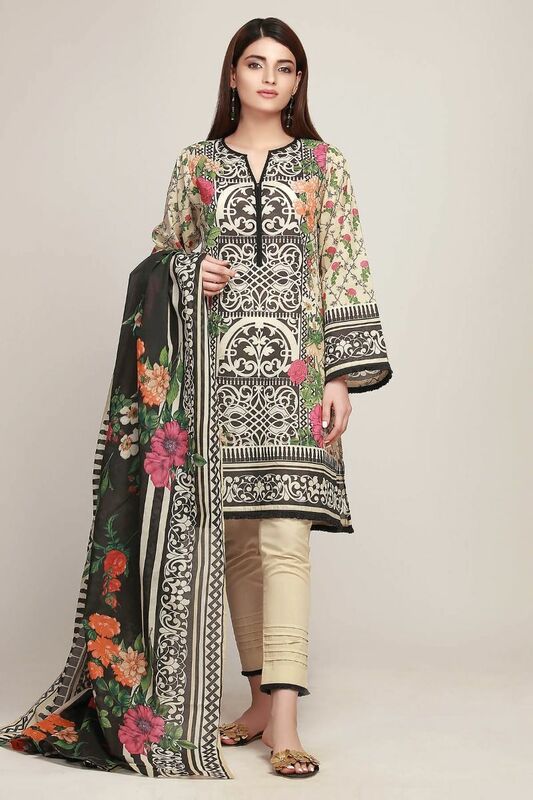 So, impress everyone with gorgeous print and embroideries as dress play a big role in depicting your personality. 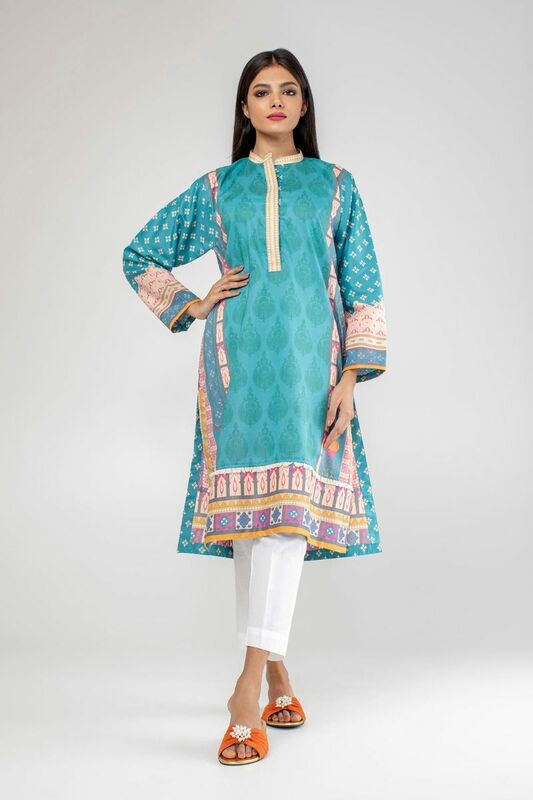 Furthermore, brace yourself ladies by wearing the beautiful kurtas from this collection.